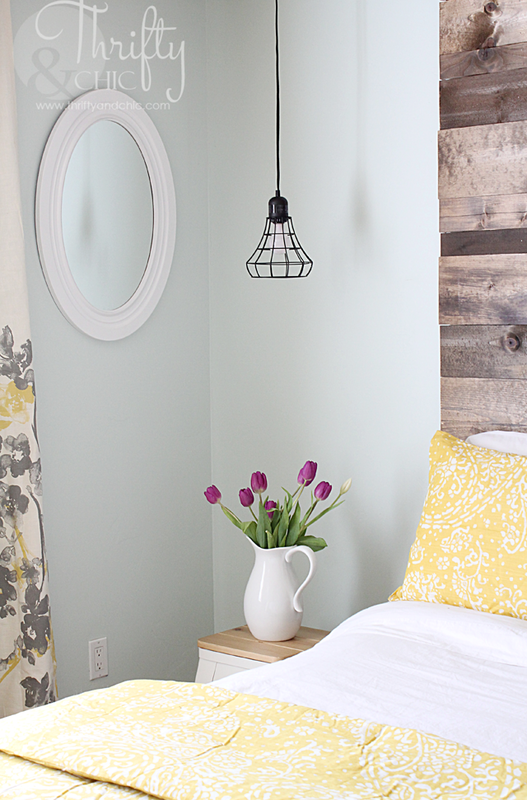 Guest Bedroom Reveal with Sherwin-Williams and a Giveaway! So...let's talk about my guest bedroom. Again. It was beige. Beige, beige, beige. Sadly, at one point in time, I loved it. It actually looked really beautiful when I first decorated it to incorporate my office. But, it didn't stay like that for long. Only maybe a year...at best. My office completely took over the whole space. My hidden shelves were still kept hidden, but all the stuff on the shelves got so full I had to start putting stuff on the ground, and that just built itself up into its own huge mess, so the curtains were bulging out. Ugh. It was just ridiculous. Plus, moving the full bed into this room and moving out the twin made it sooo cramped. Nothing was working in here anymore. My office obviously could not be contained, lol. As you know, I've been working with Sherwin-Williams to paint this space and breath new life into it. 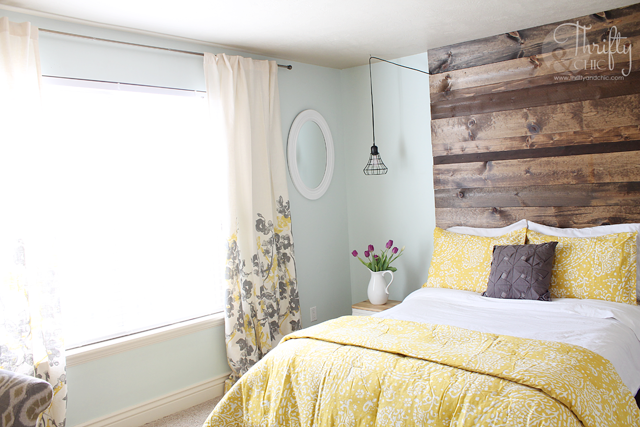 When I started this process, I didn't think I was going to move anything, just paint and add a new headboard. That's it. But when it got down to it, I was completely overwhelmed and knew something had to be done about the clutter and junk. I seriously went in here like 10 times to organize it and put it in boxes, and 9 out of those 10 times, I left the room 5 minutes later, lol. It was that bad. I finally decided that I had to move the office out of the room. That was the only solution. I just had waaaay too much stuff packed into one space. So, out went the shelves. Out went all the junk. And in went a breath of fresh air :) I didn't realize this room was this big. It became a perfect slate on which to start over. But then I decided that I was really liking the color combination of the yellows and blues and browns. So, I went out of my comfort zone...completely...and used some color on my walls. *Gasp* If you know me, and read this blog often, that is a HUGE thing. Using the Color Visualizer paint tool, I had adjusted the SW 6956 Blue Refrain just a bit, and toned it down a bit to SW 6469 Dewy. I decided to go with the Harmony® paint line since it is zero VOC. It also helps reduce odors that are already in your house. Like our pup peeing in the corner of this room...a lot. It's ridiculous. Also, I knew the new headboard was going to stink quite a bit because of the stain, so this was definitely a plus for me. And since this is zero VOC, it is great for children and pregnant women. I really wish I had known about this stuff when I was painting the babe's nursery. Not only that, but I only had to use two coats of paint on this. No primer. The coverage is amazing. And not to mention that the color is amazing also. I have to admit, I was seriously soooo nervous about painting these walls. I really actually love the beige, and how the molding pops off of it. It's a really pretty combo. I just had to keep telling myself that I CAN paint walls. It won't hurt me, lol. And plus, the whole rest of this house is beige with that same molding, so it's not like I was losing something. So, up went the paint. Up went the headboard. In came new accessories. And then I realized, that I really do like color on my walls :) This Dewy blue is just so perfect. It's like a sea breeze blue, really light and almost minty. It's just beautiful. So, let's see the before again. Yes, it is still the same room. I am so happy that I moved the office out of here. So, happy. Now...all I have to do is reorganize my new office in the basement. That should be fun, lol. For more awesome inspiration and ideas, visit Sherwin-Williams on Facebook, Twitter, Instagram, YouTube or Pinterest! Answer this question in the comments "What room would you makeover with Sherwin-Williams?" I'm actually re-doing my living room right now! i bought 13 (!) samples of light gray paint before I found the one for me (Sherwin Williams Silverpointe!). I love that they have a zero-VOC option! I still need to find a color for the accent wall, too, so a gift card would help me to really focus on SW colors again! my kitchen totally needs to be brighter. enjoy your room, it looks super relaxing! I would paint my bland white master. 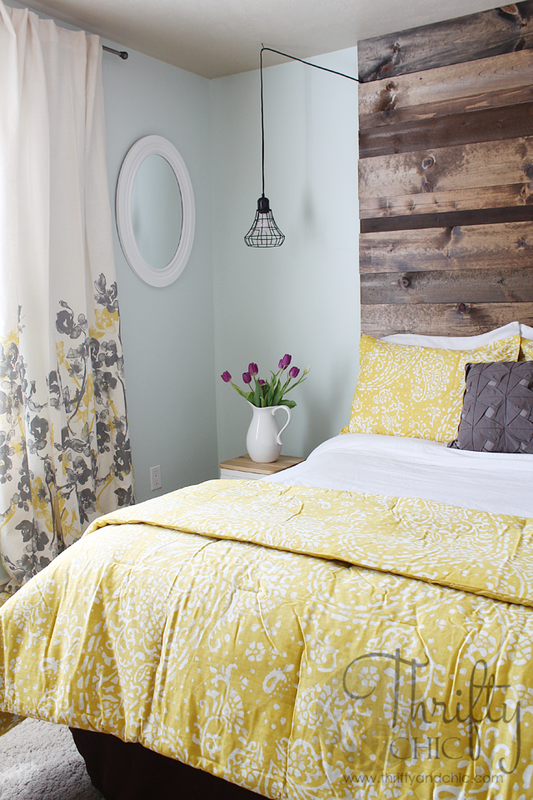 Quite possibly the color you did the guest room--it is the perfect serene shade! Love how your space turned out! It's time to paint my daughter's bedroom. We moved to this home when she was 6 years old. She left for college 7 years ago. She is now 25 years old, lives in her own home, and is getting married in 2 weeks. It has been painted only one time in the last 19 years. I didn't want to repaint because she really loved the color but it is time! The master bedroom. We have lived in this house for 4 years now and painted every room but our master bedroom. It is time to make a decision of a color and just paint it it. Thanks for the giveaway. I love the blue-mint wall color. I am thinking getting rid of my beige too. 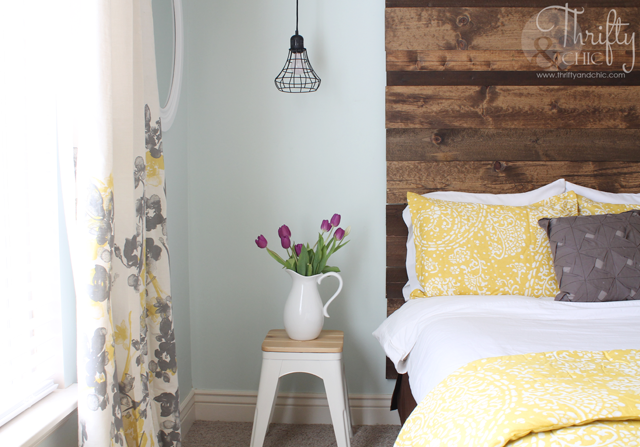 Very pretty color combination for the guest bedroom. Makes it inviting! I have a Barn Red home so I would use this towards paint for the exterior of my home! I would paint my kitchen or start on the future nursery! My guest room is in dire need of a makeover. So I would paint it. Your bedroom came out lovely. I love the color you chose, absolutely love it! I would repaint my kitchen, living room, and stairs. They all are the same color now because they flow together but they badly need a new light, fresh color! I am ready to tackle my bedroom too! My laundry room!! I painted it a navy but I'm over the dark and that light blue makes my heart skip a beat :) It looks fresh and clean and as much time as I spend in the laundry room I could use some cheering up!! The kitchen! We're getting ready to put in a new floor, and I want to repaint while we still have the icky old floor I don't have to worry about! Your room is giving me sunny, spring day at the beach. 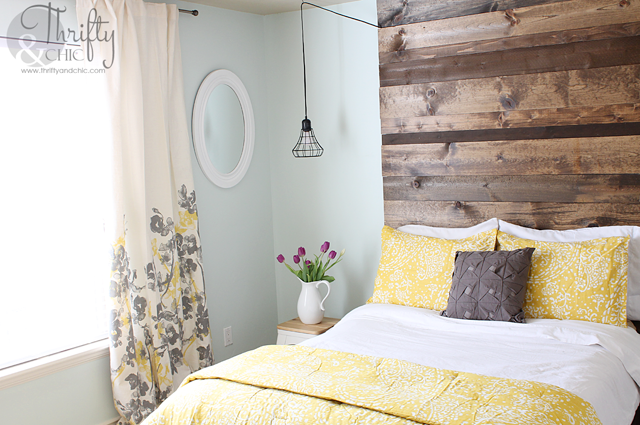 I'm loving the ceiling height wood headboard with the breezy blue wall color. My makeover choice would be my mom's boring master bath; I'm dying to transform it into an amazing, relaxing space, using SW's Worldly Gray. 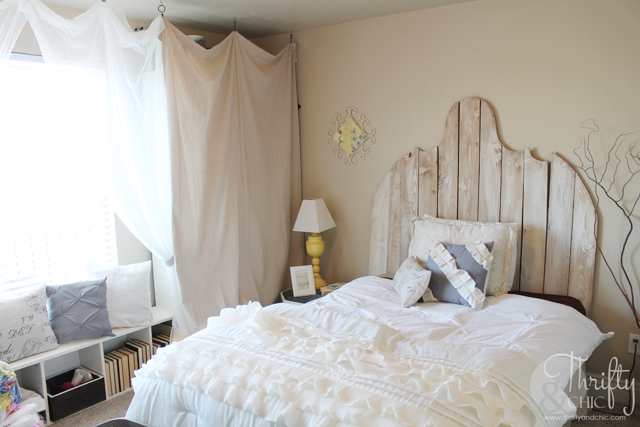 My guest bedroom and den is definitely getting a painting this summer!! The wall color is perfect! Beautiful job decorating--I'm sure you'll enjoy that room, Alicia! I'd love to redo our living room. Right now it's a not-so-lovely cinnamon color; totally out of my color comfort zone! Next on my list is the bathroom! Dewy is actually the perfect color for it! My bedroom needs a huge makeover. It's not a retreat, it's a storage space. Everything ends up in the room! I need to makeover my living room because there is no paint or pictures on the walls. Winning this gift card would help buy quality paint! Looks great! i've been following your blog for a while and i am SO PROUD of you for stepping into some color! love the new guest room! so so so fresh and refreshing. as for my house, i am moving soon, so i would love to re-paint my whole new house! i would start with the bedroom, though, because i want my bedroom to always feel like a sigh of relief when you walk into it. thanks for the sweepstakes! My master bedroom needs new paint SO badly. I think I would do my bathroom. It turned out Soooo beautiful. My kids rooms. I LOVE the color you used. Pinning it to use in my girls room. I would make over the living room with Sherwin Williams. I would make over my living room area. I would definitely start with the kitchen. My daughter's room still needs to be painted and I've already picked a Sherwin Williams color, Comical Coral. My entire house needs new paint, but the living room is the worst. So, I would paint the living room (it hasn't been painted in over 15 years). My new bathroom for sure! definitely my new crafting room i am working on - i have been wanting to paint it a soft blue and do a beach theme! I'm planning to repaint my entire house (eventually) but I need to start with my living room. Our bathroom cabinets for sure! Where is the bed spread from? I think my sister would love it. Love this room and the curtains are exactly what I am looking for. Where did you get them? LOVE the bedspread!! Where is it from? Where are the curtains from?!? I love the curtains too! Can you tell me where they are from?